Sitting in that dark saloon, I looked over at the man two tables across from me and eyed his steak. He was a fat man, perfectly round. He had a bowler cap on his head that only added to the illusion–or reality–of his roundness. He appeared to be a left-handed man, as he spoke with his left hand while holding a slab of meat on his fork. He had a knife, but he hardly used it properly. He didn’t slice the steak like an ordinary man would. He mainly used his knife for holding the steak still so that he could rip a portion off with his fork. He ate like a man starved, but there was nothing malnourished about him. I felt something stroke my leg, and it took my attention away from the round man. I looked down and saw an ugly, black cat, shallow-eyed and skinny across the ribs. It appeared to be eyeing the steak as well, or perhaps it was eyeing the man. I watched the starving creature sit there hunched over, its shoulders protruding from its back as it recalled the killer instinct–now subdued–and heeded the voices of the fearsome predators that shared its family tree. But its bones were brittle, too brittle for any amount of great pouncing, and the crumbs would attract mice later on. The killer instinct would not be so subdued then. Just then, I took notice of a man sitting out in the open, only a few feet from my table. 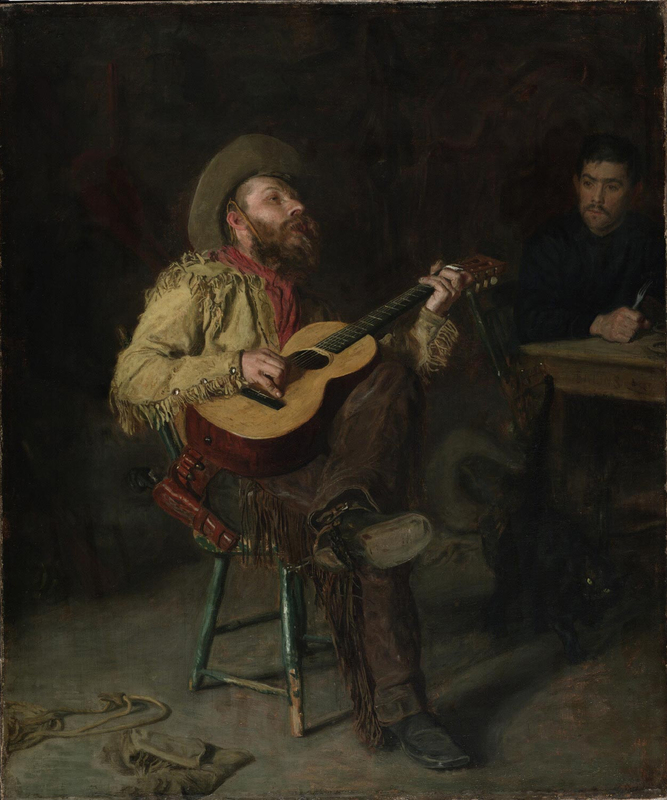 He was leaned back in a rickety, green chair and was plucking a parlor guitar. His eyes were glazed over, lost in thought as he stared into the dark shadows of the ceiling. One of his legs was propped up across the other, and every so often he would lean back upon the skinny, back legs of the chair and my heart would race. He looked like he had just walked out of an old folk tale. His pants and coat had fringes of leather hanging off of them all across his arms and legs. His hat was on the crown of his head, with the chinstrap lost somewhere in his overgrown beard. I had failed to pay much attention to him at first, but what caught my attention the most was when I realized he had been plucking the same three chords over and over again for the entirety of the time I had been there. I listened more closely, and sure enough, he was rocking back and forth on the same three chords, adding embellishments in at the same places each go round and never wandering from his rhythm. I looked into his eyes again and saw the same glazed look. I assumed he was drunk or daft, or quite possibly a good share of both. Perhaps one had brought on the other. I glanced down behind his foot and, not surprisingly, noticed a good sized bottle of whiskey, half empty. I suddenly felt sorry for the man, knowing surely he had drunken his good sense away. I looked around the room and listened to the conversations, all meaningless from what I could hear. None seemed to pay him any mind at all, though he showed no interest in their attention. I resumed my previous state of waiting. The steak had still not come, but the round man had long since finished his. A look of great displeasure overtook him after he took his last bite and looked down at the empty plate. It was pitiful, but strangely I felt sorry for him as well. Just then, the drunk with the guitar started to sing. His voice was low and hoarse, the kind that gets muffled behind an over-abundance of whiskers. His singing was quiet, too quiet for anyone to notice. Even being a few feet away from him, I still had to strain to hear what he sang. The room of people still paid no mind to the man, and the growing conversations made a few of his words very difficult to make out. The notes he held out were as rickety as the chair he was in, but the way he scooped his tone up when he sang only added to the heartbreak. His pitch shimmered as he sang like a man trying to speak while shivering. He sang as if his tongue was partially numb, and his lack of deep breathing added an “H” to most of his words as he sang while exhaling so that “Smile” sounded like “Shmile” and “While” sounded like “Hwhile.” At the end of the verse, he took to picking the same chords again the way he had done before. He noodled a bit, embellishing the song a little more than he previously had, but after several moments, I expected him to begin singing again. Instead, he fell back into his dazed repetition of playing the chords over and over. I looked into his eyes once more, searching for the heart behind the man, but his eyes seemed to give a message contrary to that of his singing. The man was truly a drunk. He seemed to be a poet as well, perhaps, but he was no less a drunk. Just as I began to drift off once more, he carried on his whispered singing. His last words fell off short as he eyed a woman with a steak in her hand. She brought it to my table and set it down, paying no mind to the man. “Sorry for the wait, Mister,” she said in a cheerful, yet nasally tone. I nodded, but frankly, I was more interested in the man. She lifted her eyes and scowled, although I believe she thought she had smiled. She let out a “Hmph” as she turned and walked away. I looked over at the man as she passed him. His eyes lifted from the steak to my own eyes, and I looked back into his eyes. His soul appeared, and he carried on singing. The man let out a shallow sigh, the deepest I believe he was capable of taking. He spun his guitar around and reached down for the whiskey bottle, but I stopped him. He stared at me for a moment, and then a small grin came across one side of his face. “Ain’t no good a’tall,” he replied. His smile grew, and I returned one. I cut off half the steak slowly, thinking of how the round man had torn his while I sliced the knife through it back and forth. I wanted very much to tear through mine as well. I stabbed one portion with the knife and lifted it to him. He grabbed it and lifted it up. “Much obliged, stranger,” he said. I nodded, unsure of what to say. He stood there for an extra moment and smiled, and then he lifted his guitar by the neck and walked out of the saloon with the guitar in one hand and the steak in the other. Even then, no one paid him any mind, and he walked through the swinging door and disappeared into the night. I looked down at my steak, now much smaller than what I had thought of when I ordered it. It looked good nonetheless, and as I took off my first bite and placed it into my mouth, I looked over at the floor where the man had sat, and something caught my eye. His whiskey bottle was still there, sitting on the ground. And there it remained, half empty.